The movie is meeting with mixed reviews around the Internet, though as with all things I hope to find parts of it I can enjoy - I've not made it yet but hopefully over the weekend! At the end of the day, my opinion still is that these live action movies have introduced the concept of Transformers to a whole new generation of kids, and have reinvigorated the entire brand due to their amazing box office success (55 million opening day on Wednesday - a new record)! Solid brand support can only be good for us collectors, so be thankful for Skids' gold tooth and Devestator's Wrecking Balls, if you can! But, now the movie is out, it will be a huge global success, and we can get back to the business of archiving all of these great toys! 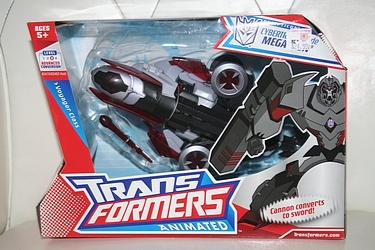 Let's continue our Transformers theme, but swing back to a non-Revenge line with Voyager Class Megatron from Transformers Animated! All of the excellent show-accurate toys in this line serve to make us sad that the show has been canceled, but with luck Hasbro will follow through on releasing the last waves of figures sometime later on. Click the image below for more shots of Megatron and his excellent bio!